Bangladesh Archery Team will participate in the upcoming Asia Cup 2019 Archery tournament which will start from March 25. A press conference was held before Bangladesh archers’ departure to take part in Asia Cup World Ranking Tournament 2019 at Bangladesh Olympic Association in the capital on Saturday. 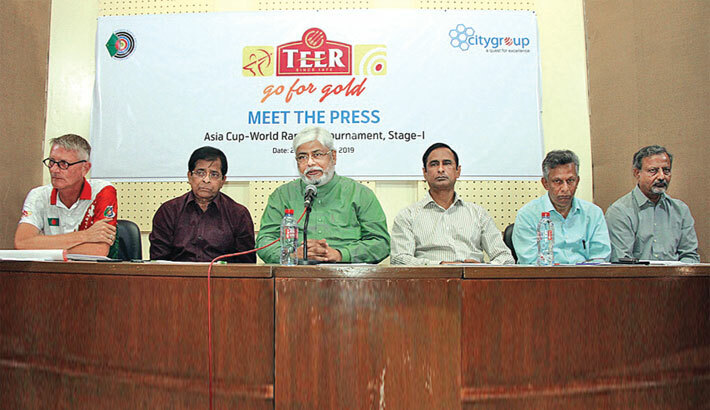 Bangladesh Archery Federation General Secretary Kazi Rajib Uddin Ahmed Chapol along with Vice-President Anisur Rahman Dipu, City Group Executive Director Zafor Uddin, BAF Publicity Secretary Rafiqul Islam Tipu and Coach Martin Frederick were present in the press conference. Bangladesh Olympic Association Deputy Secretary General Asaduzzaman Kohinoor also spoke in the event. Archers from 23 countries will be participating in this tournament. The tournament is going to be hosted at Bangkok in Thailand from March 25 and will end on March 30. A total of 12 archers along with 5 officials will tour Thailand for the tournament. Both men and women archers from Bangladesh will compete in recurve and compound division in stage-1. 6 players will compete in recurve division including 3 women and 6 others will fight for glory in compound division. Bangladeshs Archery head coach Frederick Martin was pragmatic in his expectation as he declined to make any hollow promises about Bangladesh claiming gold medals in the upcoming tournament but he expects some good performance from the archers. He said reaching semi-final stage is his initial target. “I don’t want to put too much pressure on them (archers) and I won’t guarantee Gold but still we can expect some good performance,” told Martin. “The tournament will be tough. They will face good opponents but we have talented archers so I think they can bring two or three gold medals for us,” added Martin. Bangladesh Archery Federation General Secretary and Chief of Archery Development Committee for Asia Kazi Rajib Uddin Ahmed Chapol was present and presided the press briefing as he said he will not put extra pressure on the archers by asking for a spot in the final but he wants the archers to be confident and work hard. “This is a very big tournament for us. I don’t want to pressurise our players. Let’s give them the confidence it’s what they need the most right now,” Chapol told during the press conference.